With the second round of the HSBC World Rugby Sevens Series kicking off in Hamilton, New Zealand, this weekend, Mitsubishi Motors South Africa has announced that they have renewed Snyman’s vehicle sponsorship for 2019. “It is great to have Philip on board the Mitsubishi Motors SA team and we are proud to be associated with him – not only as South Africa’s most successful Blitzboks captain ever, but also because of his rugby development initiatives,” says Nic Campbell, General Manager of Mitsubishi Motors South Africa. “It is a great honour, and it’s heartening when sponsors are supporting me this way,” says the 31-year-old rugby professional who is captaining the Blitzboks in 2019 for a third season. 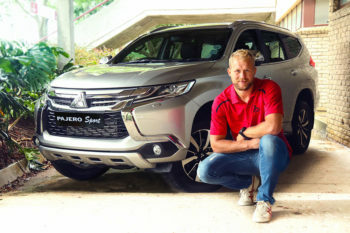 The Pajero Sport is also Snyman’s third vehicle from the Mitsubishi Motors family, and he is extremely impressed by the latest class-leading technology on offer from the Mitsubishi Motors stable. “I feel honoured to be driving a car that has been nominated for the 2019 AutoTrader Car of the Year competition,” he said before the team left for New Zealand recently in their quest for the World Rugby Sevens championship. After driving the Pajero Sport for more than two years, Snyman says some of the most outstanding features of the car are those that protect his family. “I know my daughter is safe in her baby seat thanks to the ISOFIX anchors, and the vehicle offers more than enough space in the back for all the baby gear. It is so much more than just a family car,” he says. “We do not only support Philip and his family, but also Philip and his team in their quest to bring the trophy home again this year – and if they do, the Pajero Sport in 7-seater guise has enough space for the whole team and the trophy! We wish Philip and the Blitzbokke all the best for the 2019 HSBC World Rugby Sevens Series, concluded Campbell.